For the concert tour this film is based upon, see The Wall Live (2010–13). Roger Waters: The Wall is a British concert film by Roger Waters. Directed by Waters and Sean Evans, it captures performances of Waters' live tour. It premiered in the Special Presentations section of the 2014 Toronto International Film Festival. At the premiere, directors Roger Waters and Sean Evans were in attendance and received praise from those in the audience that night. The concert design and execution draws heavily from the original concert of the same name that followed the release of the 1979 album, The Wall. ^ "ROGER WATERS THE WALL | British Board of Film Classification". Retrieved 4 April 2019. ^ "Toronto Film Festival Completes Lineup". Variety. Retrieved 20 August 2014. 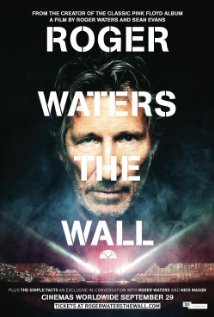 ^ "Roger Waters The Wall Movie Review – World Premiere". T Mak World. Retrieved 8 September 2014. "The Pros and Cons of Hitch Hiking"
"What God Wants, Part I"
"To Kill the Child/Leaving Beirut"
This article about a British documentary film is a stub. You can help Wikipedia by expanding it. This page was last edited on 5 April 2019, at 07:28 (UTC).